Oklahoma Medical Marijuana Bond • Surety One, Inc. The law has been promulgated and emergency rules now being drawn for marijuana facility operations. An Oklahoma medical marijuana bond will be required of operators as a prerequisite for licensing. Pursuant to Title 310, Chapter 681, a "Commercial Establishment" means an entity licensed by the Oklahoma Medical Marijuana Authority as a medical marijuana dispensary, grower, processor or researcher", which are the also the classes of license which will be offered. The Oklahoma medical marijuana surety bonds is addressed in section 5-19. The bond must run to the Oklahoma State Department of Health, be filed with the application for license and be maintained through the term of license. The bond must guarantee the payment of financial penalties incurred during the course of operations of the licensee to include any financial penalties imposed or pending at the time of a license revocation. The medical marijuana bond also guarantees payment of those costs associated with disposing of unused medical marijuana and medical marijuana products or hazardous materials or waste. The bond shall be executed by a surety company licensed by the Oklahoma Insurance Commissioner. The amount of the bond shall be maintained at one hundred thousand dollars ($100,000) and must be renewed by continuation certificate each year. 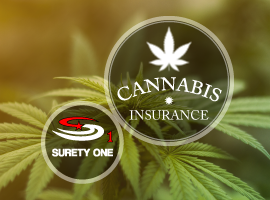 SuretyOne.com is the most agile underwriter of the surety bonds needed by the medical marijuana industry. We firmly believe in supporting the availability of cannabis products to patients that benefit from them. We will consider applications for dispensaries, processors, researchers, delivery services and grow operations in all states where current legislation favors legal marijuana businesses. For further information about the Oklahoma medical marijuana bond contact us at (800) 373-2804, email Underwriting@SuretyOne.com or chat with us live here.